True Lime is made from the juice and oils of fresh Limes! True Lime behaves almost identically to fresh lime juice when used in water, drinks and recipes. 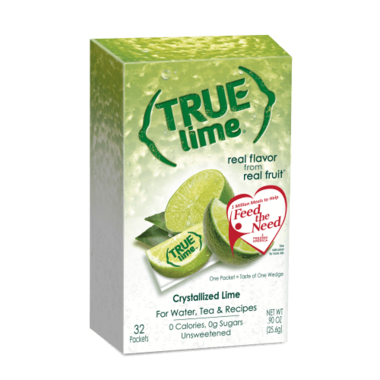 Instead of squeezing and storing messy citrus fruits, simply tear open a pack of True Lime! Ingredients: Crystallized Lime [citric acid, lime oil, lime juice]. I think I must be a little more sensitive to the flavour than most of the other reviewers. I usually use half a lime in a 3-cup tumbler of water, so I added one package. I found it a bit artificial. Not strong, just not what I was expecting based on the reviews. Still, I would buy this again just to have on hand when I run out of fresh limes or the price of limes goes through the roof. Awesome product! Great to have on hand when the limes in the store look kinda â€˜mehâ€™. Delicious added to club soda/soda water for a refreshing drink! Fantastic product! Great to throw in a bag and use everywhere. Would like to see well.ca carry the shaker as well. Delicious lime taste in both water and also to use in baking. Saves buying limes at the store when they don't look so hot fresh. Packaging is convenient to take on the go! True Citrus has changed my water game forever. They are the only brand I've found that creates crystallized lemon, which tastes almost better than an original slice of citrus. I put one of these packets in a big glass of water that I drink in the morning. I'll even add it to a salad dressing or in a mixed drink, or any recipe that calls for citrus. I first discovered the brand at a tea and coffee station at a Marriott hotel in Savannah, GA, so happy you carry it! !